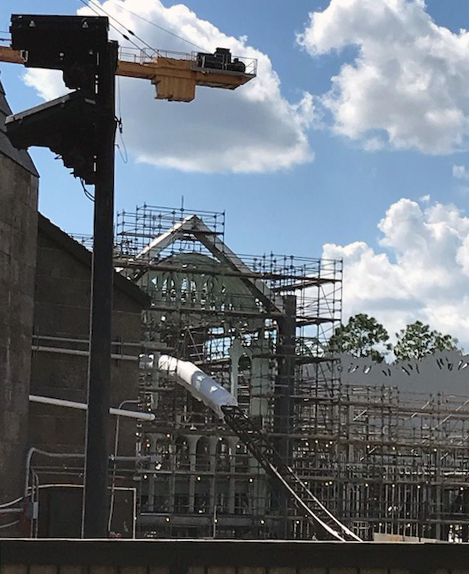 Reader Matt McDonough sent along some photos from his recent trip to Orlando, showing the current state of the upcoming Harry Potter-themed roller coaster under construction at Universal's Islands of Adventure. 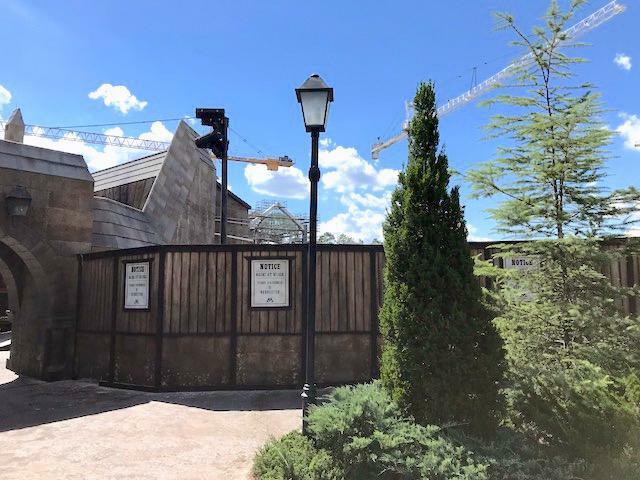 As has become routine for new projects at Universal Orlando, the resort hasn't announced much about this coaster during its construction, although the detail is becoming apparent before our eyes. This coaster will feature launches and indoor elements, including what looks like a Verbolten-style track drop. 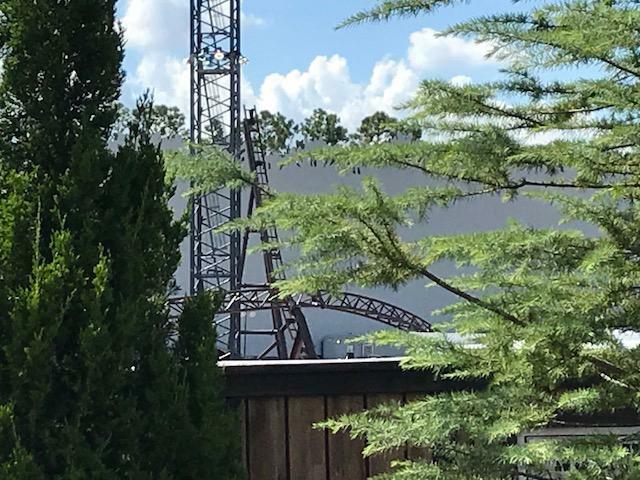 It will load in the old Dueling Dragons/Dragon Challenge building, although that structure is getting a dramatic retheming. From there, it's a wild ride through the Forbidden Forest, in between the village of Hogsmeade and the Hogwarts Express station. The as-yet-officially-unnamed coaster will open next year, boosting the popularity of the SeaWorld parking lot... because that's where we expect the queues for this and Star Wars Galaxy's Edge to meet in Christmas 2019. Oh boy, THC, the Disney fanboys are sharpening their knives over that comment. Those are a couple of Disney's better attractions, and now matter how good the new Harry Potter coaster is, if there is one screen in it anywhere it anywhere, the fanboys will automatically discount the value of the ride. @ Tim Hillman ... It's unfortunate that a few bad apples forced Robert to shut down the PM feature at TPI. Yeah, I know, TH. We've had more than our share of loonies on this website over the years. Do you realize that other than Robert, we're the longest term, active members on TPI? Not sure what to think of that, either I don't have a life or I just enjoy this site that much. However, I'm OK if Robert passes you my e-mail (as if he didn't have enough other stuff to do). Someone give Tim Hillman an award!! Longest active member of a site dedicated to theme parks!! Congrats buddy! To answer your earlier question...its always more fun to troll those who are easy targets (you,TH,Russell). The rest of the time...it's just nice discussing theme parks with those of similar interests. Coming from you, Barry, I'll take it as a compliment! Back to first comment, I bet it will be better than those, but they are admittedly kiddie coasters. I seem to remember that that this is a 'family' coaster, and, yes, it will have screens, and I hope it does. I love the Potter universe, and I don't see how they can do it justice without it. I will say I am taking my first big WDW only extended trip soon. Been to DL, UO, and USH several times, and have not been back to WDW since we were burned by the FP+. Last time they had just put in the Snow White Mine Train and never could get to it, but this time we can. Honestly, we have no interest in the Slinky Dog. I will say this: wow, they have jacked up the cost of everything. We ususally stay at a deluxe resort, but had to go with a moderate to get the cost down. Looking forward to the fantastic food and the classic attractions, and will be able to see how the SDMT is in action (and the show).